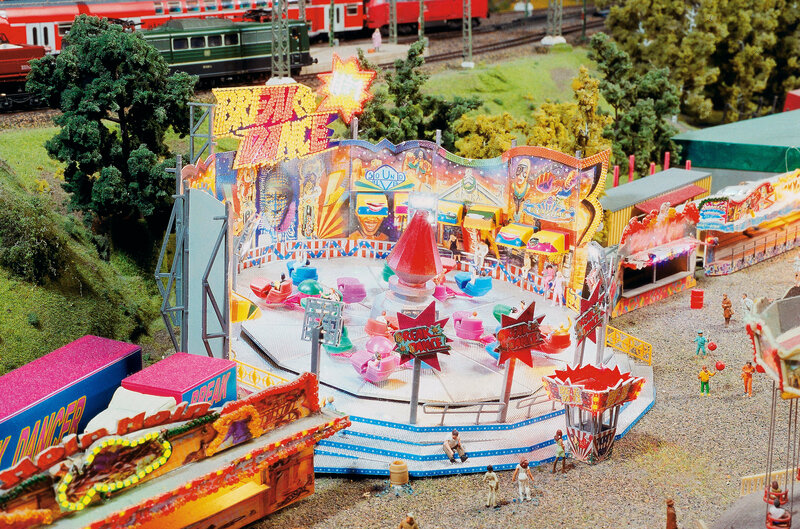 The lively fun fair is exactly what Wunderland inhabitants love. The inhabitants of Middle Germany are commonly known as happy people, always in the mood to celebrate. Therefore, it is not surprising that Wunderland’s largest fun fair is located there and allows people to enjoy themselves on rides 365 days a year. The most popular attractions are the giant wheel, the free fall tower, and the "Wilde Maus" rollercoaster. All the replicas of original rides are fully functional and five of them can be started by pushing the action button at the railing. Building the rides was technically quite challenging, as the commercially available models of fun rides are not meant for long-term usage. Therefore, the technical workshop equipped the rides with custom motors, specially designed roller bearings, and metal transmissions. Beside the rides, the colorful array of lights all over the fair ground is just awesome. In total, 4,811 LEDs have been installed, all of them controlled individually.